I'm in a state of shock. Vasari is best known as the biographer for the great (male) artists of the Italian Renaissance - Michelangelo, Donatello, Raphael, Leonardo, etc. But did you know that Vasari mentioned four females in his Lives of the Artists? I had no idea, until I discovered Vasari's chapter on Properzia de'Rossi the other night. I seriously was dumbfounded - I stared at the word "sculptress" for at least ten seconds. 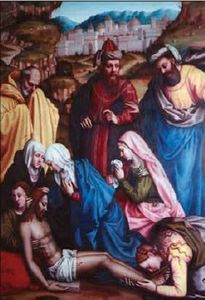 On the left is Lamentation with Saints (16th century) by Sister Plautilla (Plautilla Nelli). Vasari mentions that Plautilla was an extremely prolific painter, but surprisingly (or perhaps not-so-surprisingly), only three works are definitively attributed to her today. In an effort to bring public awareness to this artist, the Florence Committee of National Museum Women in the Arts paid to have Lamentation restored in 2006 (see news article here). I think it's especially interesting that Vasari doesn't make any statements about Plautilla's divine role as an artist or God-given talent (which he makes about the male artists in his book). Instead, he stresses that Plautilla and the other ]female artists learned and acquired artistic skill. Futhermore, Vasari wrote this about Plautilla: "But best among her works are those she imitated from others, which demonstrates that she would have created marvellous works if, like men, she had been able to study and work on design and draw natural objects from life. 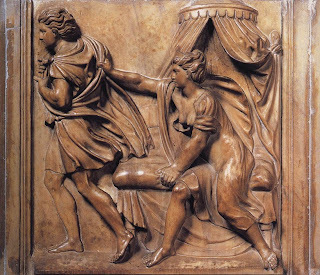 "2 Plautilla was alive when Vasari wrote her biography, and I wonder if she cringed to know that Vasari thought her best works were those that she copied from the divinely inspired, male artists. Sofonisba Anguissola is the only female artist with whom I was familiar before reading Vasari. I read about Anguissola when I was doing research on Caravaggio's Boy Bitten by a Lizard. Several scholars think that Caravaggio's two versions of this subject were influenced by Anguissola's Boy Bitten by a Crayfish (also called Boy Bitten by a Crab, c. 1554, on right). Mary Garrard has discussed Anguissola's drawing in depth. She mentioned how Anguissola painted a picture of a laughing girls, which Michelangelo saw and commented that "the image of a crying boy would have been better. "3 Garrard finds that Michelangelo's statement implied that boys are better artistic subjects than girls, and tragedy is better than comedy.4 Upon hearing this, Anguissola sent Michelangelo the drawing of Boy Bitten by a Crayfish. 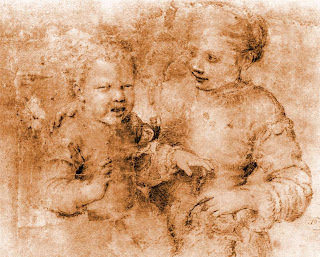 However, instead of showing the crying male in a tragic, noble position (and follow Michelangelo's inferred suggestion), Anguissola shows the boy in an ignoble state with an amused female standing nearby. Wasn't Anguissola a little sassy? I wonder what Michelangelo thought of the drawing. Madonna Lucrezia is the other female artist mentioned by Vasari. Unfortunately, there isn't any (known) surviving art by her. In fact, we know little about Lucrezia beyond that she was active around 1560 and her teacher was Alessandro Allori. It's sad to think that her work and life is lost to history, most likely because she was a female. I'm glad that Vasari made the effort to mention her and these other females in his Lives, but also disappointed that most females didn't receive artistic opportunity or art historical attention at the time. It makes me wonder what other female artists have been unappreciated and obscured by historical biases. Is anyone else shocked that Vasari mentioned female artists in his text? 1 Giorgio Vasari, The Lives of the Artists, translation by Julia Conway Bondanella and Peter Bondanella (London: Oxford University Press, 1991), 565. 3 Mary D. Garrard, "Here's Looking at Me: Sofonisba Anguissola and the Problem of the Woman Artist,” Renaissance Quarterly 47, no. 3 (Autumn, 1994): 611.